Lord of the peanut, lord of the play. 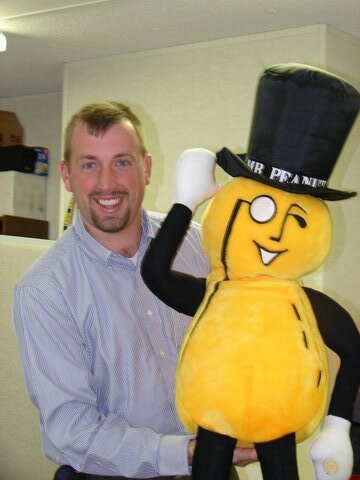 Me with Mr. Peanut, a gift from a family member with a sick sense of humor. Last week I got a phone call that makes every parent’s heart stop for a minute. I learned that my oldest son was being rushed to the emergency room. Unfortunately, we both share the same life-threatening allergy to peanuts. Unfortunately for him, he accidentally ate a cracker laced with the deadly nut and only realized it after it hit the bottom of his bottomless pit of a stomach. Such is what happens when you eat first, read ingredient labels second. I have been in his shoes too many times to count. To those without the allergy, having an allergy to a peanut is amusing. In the early days, when people learned of my allergy – they would laugh in disbelief, as if I was making this up. “Really? A little peanut? Are you kidding me?” The name itself conjures images of something tiny. When an embryo is growing in the womb of a mother, it is often referred to as the little “peanut.” When a toddler is among older siblings, you may hear him being called the “peanut.” It certainly does not seem big or strong enough to end a life. Statistically, it kills about 10 people per year in the United States alone. I am pretty committed to not let my son or I join that list of ten. The peanut allergy is somewhat unpredictable. It can certainly be unforgiving. Some people can have an immediate reaction at the smell of it. (Even a synthetic peanut-scented “scratch and sniff” sticker bothers me!) Others react when they touch it. Some react when it merely touches their lips. Everyone with the allergy reacts when it is ingested. As far as reactions go, a variety of symptoms can occur, varying person to person. Hives. swollen eyes, itchy tongue. In extreme cases, anaphylaxis sets in. In other words, your throat swells to the point that your air passage is closed. It is known as one of the more deadly allergies out there because of the notorious speed at which it moves. It is not unheard of to go from contact to corpse within a matter of minutes. (One girl died, a few years ago, after being kissed by her boyfriend after he ate a PB & J sandwich.) Having almost died twice from my reactions, I understand how serious this allergy can be. I prayed. I drove fast. I started to worry. And then I remembered who is the Lord of the peanut. Life is fragile like that. Occasionally, it reminds us that we are not as strong or invincible as we want to believe. We are one car accident away from life change – even if we wear a belt. We are one trip to the doctor away from devastation – even when we feel healthy. Those of us in South Carolina know that we are one play away on the ball field unable to see the injury to come to a beloved running back. One accident, one diagnosis, one slalom on the slope, one slip on the job, one phone call, one incident from our lives being changed – forever. If I have learned anything about life during my 4+ decades here, it is how short and precious life really is. We ALL pray, even if schools say we cannot. We ALL bend a knee, even if we look foolish to others. We ALL quiet our souls, in spite of the noise around us. We ALL change our Facebook status, imploring an army of other prayers. At some point, we are all reminded that there is something bigger than us out there that we must beg/plead to – when life is in the balance. The saying is true, “There are no atheists in foxholes.” Turbulence at 33,000 feet can make even the hardened skeptic pray. My son returned home from the emergency room in record time. He was fine. The anti-dote (epinephrine) was given and he was breathing easy, once again. As I put my head to the pillow, I realized I had averted a life-changing incident. I was grateful for the outcome and thankful I had another day to be his Dad. I also renewed my hatred for peanuts, vowed to never visit Georgia and committed to a life of jihad against that form of protein. As my body was shutting down for the night, my thoughts were lifted upward. I thought about the deadly allergy to sin we all possess. I remembered the anti-dote in Christ, the Epi-Pen of God. But more than that, I was reminded that He is still in charge here, even on the days I forget that. The riser of the sun and the Rotator of the moon, He rules even our diets. Lord of both Presidents and peanuts, sometimes He uses laws to get our attention while other times He uses allergies. Should the sunset escape our view, should we ignore the praises of birds, should we be oblivious to our daily dose of oxygen He liberally provides even to those who hate Him, God is still able to get our attention. As King David reminded us in Proverbs 21, “The king’s heart is like channels of water in the hand of the Lord; He turns it wherever He wishes.” He got Moses attention through a burning bush (Exodus 3). He got Pharaoh’s attention through the death of his son (Exodus 12). God can use hurricanes, earthquakes & fires but He prefers to speak in a whisper – just ask Elijah (I Kings 19). He has an entire world at His disposal to get your attention too. What will it take for you to tilt your ear? Last night I took my two boys to see their sister in her school play. The only thing more dreadful than attending a middle school play is to watch a middle school girls basketball game. Even hockey games have higher scores! As you can imagine, the last thing two boys want to do is attend their sister’s school play on a Saturday night. Complaints abounded. “Do we have to?” “She doesn’t care if we go!” “Dad, it will be boring.” “Her part isn’t that big, can’t we just watch her scene and leave?” I have to say, their complaints were convincing, if not compelling. I was certainly tempted to leave them home. I realized at that moment I was raising two attorneys. Unmoved, we all went to the play. To their chagrin, I even sat in the very front row. They were not going to miss their sister’s theatrical debut. As they both sat sullen in the front row, I watched their transformation. As the play went on, they both stared at the actors in front of them. They laughed at all the right moments. It was obvious, they were actually engaged and enjoying themselves. As a parent, I sat relieved. Relieved I didn’t cave to their complaints. Relieved that I had committed to doing the right thing, even if it made me unpopular. Relieved that they were enjoying themselves. As we left, my older son looked at me sheepishly and said, “Dad, thanks for making us go. I enjoyed it.” All parents cherish those rare moments. The battle was worth it. In those moments, clarity is gifted to me. I see life more clearly. I slowly begin to understand why God allows us to endure certain trials. Now I understand why we must be forced, at times, to do things we don’t want to do. We buck, we complain, we cry and whine and yet God, often silent, remains unmoved. Only after the experience, do we learn the lesson. Only after the pain, do we see the purpose. Only after the trial, do we learn to trust. He does know what He’s doing, even when He seems like He doesn’t. He doesn’t hate us, as we sometimes think in our adolescent faith. He doesn’t want us miserable, though His decisions may make us miserable. He puts us in the front row and makes us uncomfortable knowing that transformation is around the corner, should we humble ourselves to see it. He is far more interested in our holiness than our happiness and He loves us in spite of how we treat Him. He is Lord of the peanut. I was lord of the play. Both my sons and I learned a bit about parental sovereignty this week and how we are better because of it. Unless I have to attend a middle school girl’s basketball game. No good can come from that. Oh, and for the record – my son did go to school that next morning. Nice try, kid.